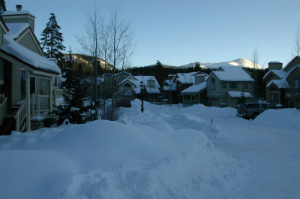 Breckenridge Mountain Village homes for sale are located in the heart of Breckenridge just north of the Breckenridge ice arenas on Boreas Pass Road and southwest of French Street. The south side of Breckenridge Main Street is only a couple blocks away. Many town of Breckenridge hiking trails begin near Breckenridge Mountain Village and its possible to use them to connect to the Blue River Trail, and Baldy Mountain. The neighborhood has a small greenspace, and it’s only a block from Carter Park, a town park with playground, volleyball courts, four tennis courts and picnic area. Walk out the door from any Breckenridge Mountain Village home for sale, and Main Street is just a few steps away. 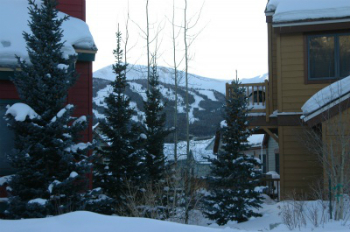 There are a few dozen homes in the neighborhood, and each one is compatible in style with the others in the subdivision, have great views of the Breckenridge Ski Resort, and sit compactly on a small lot. This neighborhood is a relatively new addition to in-town Breckenridge residential areas, and was completed in the late 1990s. From the 1880s the area where Ridge and Main come together, where Breckenridge Mountain Village sits today, was in the crook of the railroad tracks. Coming down from Boreas Pass freight trains came off on a siding here, and others crossed the Blue River to a station on the west side of Main. Around 1900, the land was occupied by the reputed ‘finest machine shop in the world’ built by the Gold Pan Mining Company. The offices were plush and several local weddings happened here. Ore milling, waterworks and a lot of steel storage happened on this site, but was abandoned before WWII. Size: 1669 sq. ft to 4008 sq. ft. Amenities: in town, free-standing single family home, yard, nice views, flat lots, close neighborhood, on shuttle. From the traffic circle, or Main Street Breckenridge, proceed to the south side of town and take a left on Boreas Pass Rd. then left onto French Street, Breckenridge Mountain Village is the first left. Alternatively, take French Street toward Boreas Pass road and turn right into the Breckenridge Mountain Village neighborhood on Powder Ridge Dr.
Let an experienced agent from Breckenridge Associates help you to navigate the local real estate market.Send us a message, or call us at (970) 453-2200.